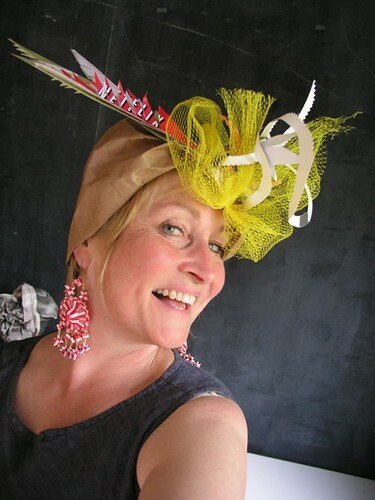 I can't think of a better way to kick off the work week than by introducing Alyn Carlson, a Massachusetts fine artist, graphic designer, actress, and even a hat maker. 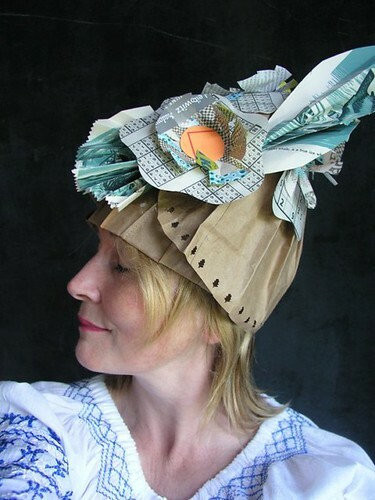 Her Etsy shop, Madame Alyn's Bin, is where you'll find a whimsical collection of headgear created from random papers and throwaways that would ordinarily be destined for - you guessed it - the trash bin. A sweet little turban style hoochie coochie marimba wannabee. An oversized Netflix and coated postcard feather, letterpress scrap, mesh lemon bag makes this one a favorite at beach clean up day. 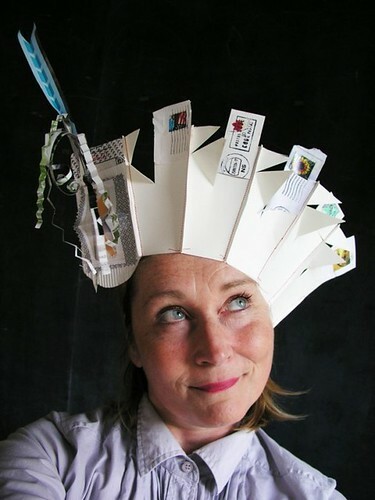 Cancelled stamps, magazines, a bill envelope, letterpress scrap, and thread come together as this chef-style hat called Queen of the Compost. I bet she's thinking about what to make for dinner - ha, or not. The Sustainable Cloche: Lovely little"belle" as the French call a cloche, built by layering grocery bags. Tiny pine trees punched out of its edge, magazine, vintage whaling storybook and Sudoku pages form rosettes. Please note: storybook and magazine will vary depending on this week's thrift store sale bin. 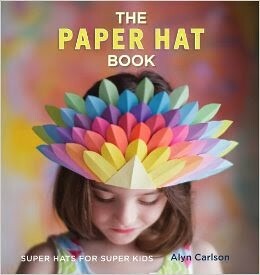 While the hats in the shop would be ideal for any adult at a loss as to what to wear to a costume party, she has a book coming out on September 1 for Quarry called The Paper Hat Book: Super Hats for Super Kids. Alyn designed twenty hats that are great projects for parents and kids to make together. Easily obtained goods such as shopping bags, newspapers, comics, junk mail, glue, and imagination are the main ingredients for creating playful dress-up garb. Designs range from pirates and Viking warriors to floral flappers and butterflies. 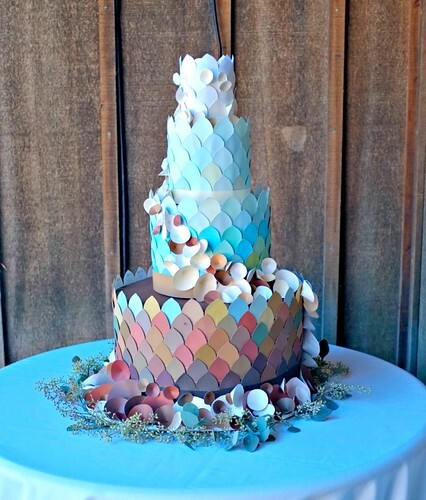 She paints lovely abstract landscapes, but has been known to dabble in the trendy craft world as well... consider this stunning cake she made for a friend's wedding a couple of years ago using retired paint chips. It was designed to hold one very special cupcake. 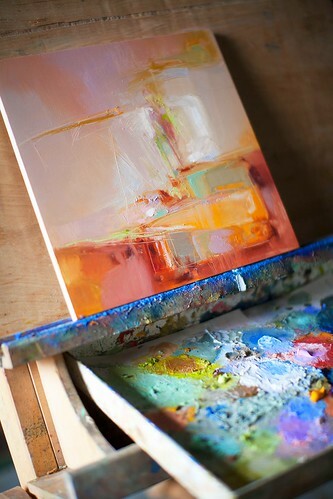 Alyn blogs at Colorgirl Alyn and can be contacted via her Etsy shop. Gorgeous and creative work! You share the best things. I love her painting, the hats, and the paper cake. All of it. I LOVE THIS!!!!! I have to order this for my boys. We love coming up with fun hats, especially for Christmas. LOVE. Oh oh oh! Love the wedding cake!! Love these paper creations... Magic! !